Standard Sizes (Overall W x D x H). 700 x 600 x 355 mm. Unlike many other sellers we are a High street store with many years experience building kits. We are at hand with any building or decorating help you may need. Please order early in plenty of time as unexpected delays can happen. In the event of any delays you will be notified as soon as possible. In the event of any visible damage to the packaging; the item must be refused and not signed for. Failure to adhere to either of these stated conditions mean any problems arising after this time will be chargeable. 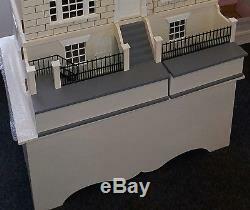 The item "Dolls House Plinth Table Stand Unpainted Collectable kit 700mm x 600mm" is in sale since Tuesday, March 13, 2018. This item is in the category "Dolls & Bears\Dolls' Miniatures & Houses\Dolls' Houses". The seller is "tolboothminiaturesltd" and is located in Falkirk, Falkirk. This item can be shipped to United Kingdom, Austria, Belgium, Bulgaria, Croatia, Cyprus, Czech republic, Denmark, Estonia, Finland, Germany, Greece, Hungary, Ireland, Italy, Latvia, Lithuania, Luxembourg, Malta, Netherlands, Poland, Portugal, Romania, Slovakia, Slovenia, Spain, Sweden, Australia, United States, Canada, Brazil, New Zealand, China, Hong Kong, Norway, Indonesia, Malaysia, Mexico, Singapore, South Korea, Switzerland, Taiwan, Thailand, Chile.